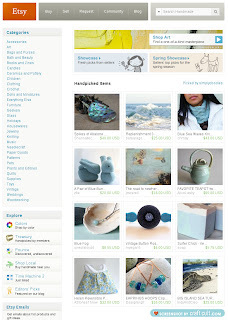 I have never been on the Front Page of Etsy before. I've been in treasuries before, and even some really popular ones, but I've never had one go to the Front Page. Well, that all changed today. I woke up this morning to a convo on Etsy from one of my Homefront team mates congratulating me on my front page appearance. Still foggy brained, I just figured it must be a mix-up. The only treasury that I had been in had expired yesterday. Then I saw that another one of my Homefronters had left me a link on my Facebook page. I checked it out, and sure enough there I was!! How cool is that?!!??! Here's a screen shot for you to check out! Thanks, again, to all of my Homefront peeps for letting me know !